I arrived at my sister and brother-in-law’s home in St. Catharines late last week as the hype about Canada Day mounted. We decided to delay the usual Saturday morning breakfast at an American chain restaurant to attend a nine a.m. flag-raising planned at Rennie Park (or so we misread). Upon arriving, we saw no flagpole. Everyone was busy — setting up booths and bouncy castles, checking a sound system, and frowning at the overcast sky. We had come to the wrong event and the wrong place, and too early besides. 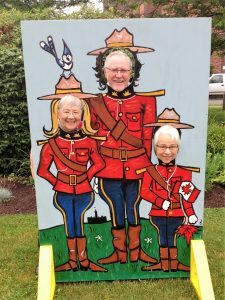 We laughed and posed playfully as a Mountie family before we left. “Í’d like to go to that”, he said. A man wearing a traffic vest invited us to come back at ten a.m. to the Royal Canadian Legion, the rain alternative to the park. Breakfast at the local Tim Horton’s would fill the gap nicely, eh? We returned to the Legion to discover the ceremony would occur at 11 a.m. Time for a walk to see the first lock of the second Welland Canal, built in the 1800s; Lake Ontario near a hundred-year high water level; and a Canada goose crossing sign. Rain chased us back early to find about 50 empty chairs — 21 for the new citizens. We chose three guest chairs and looked around. A giant flag, a portrait of Queen Elizabeth, and Happy Canada Day banners bedecked a drab pub. A hastily-hung row of table cloths masked the bar — until the tape failed. Two huge rectangular platters of red and white cupcakes arrived as we waited. By 11 a.m., the new citizens and hundreds of guests packed the room. A town crier got everyone’s attention with his “Hear ye, Hear ye” commands and mediaeval costume. A kilted piper, droning “The Maple Leaf Forever,” led in the dignitaries. A scarlet-clad Mountie, a robed judge, the local MP, the mayor and his chain, and a peace-keeper vet wearing medals were among them. As part of the hour-long ceremony, all of us were invited to stand, place our right hands on our hearts, and join the new citizens in their oath of allegiance to the Queen. I won’t forget Canada Day, 2017. We had arrived at the right place after all. And early enough to get a seat. Bonus! This entry was posted in Writing on July 6, 2017 by Wilda. Reading your blog was at least as enjoyable as sharing the events with you which precipitated this blog. Love the title which you unfurled!